The immune system is an inherent self-defense system consisting of cells that helps the body distinguish between self and non-self molecules. Different pathways regulate different immune cells to help the body differentiate the bodies own healthy cells from disease-causing agents including bacteria, viruses, fungi, parasites, cancerous cells, and many more. All the components of the immune system have to continuously modify to keep the bodies defense up against the ever-evolving organisms that constantly are on a quest to find a new way to attack the host. This continuously evolving system sometimes reacts against the bodies own cells, identifying it as foreign, which leads to healthy tissue destruction and causes autoimmune diseases and cancers. Also, weakened defenses of the body by the immune system due to genetic, acquired causes precipitate an inherent state of anergy (unresponsiveness) that can lead to immunodeficiency diseases. An image depicting immunoglobulin can be seen below. Antigens are the molecules that are recognized and stimulate the cells of immune system. These may be different molecules within the cells like proteins, polysaccharides, or nucleoproteins and may also be the whole cell, like a tumor cell or organisms like bacteria, viruses, fungi, parasites, or agents containing genetic material such as nucleic acids or lipids. The body’s immune system can react adaptively against the antigen via 2 pathways: cellular or humoral. The cellular response is mainly a lymphocyte-mediated reaction, whereas the humoral response includes production of antibodies against the antigen by the plasma cells. Epitopes are a component of the antigen that are recognized by the immune system and determine whether the cellular or the humoral arm of the immune system shall be activated against that particular antigen. An epitope may represent a linear amino acid sequence or antigenic tertiary structure. Immunoglobulins (Igs), the term is sometimes used interchangeably with "antibodies," are glycoprotein molecules produced by B lymphocytes and plasma cells in response to an immunogen or after recognition of specific epitopes on the antigen. The antibodies then specifically bind to only those particular antigens. Immunoglobulin (Ig) is the key component of humoral immunity. The earliest cell in B-lymphocyte lineage that produces Ig is the pre-B lymphocyte. An adult human produces approximately 2-3 grams of Ig every day. Antibodies can be found on the surface of lymphocytes as an integral part of the cell membrane protein or can be freely circulating in the blood or be part of one of the body’s gland secretion. The Ig molecule is a polypeptide heterodimer that is composed of 2 identical light chains and 2 identical heavy chains connected by disulfide bonds (see the image below). Antibodies belong to immunoglobulin family of protein and have 5 isotypes (G, A, M, E, D) with further subclasses of G and A. 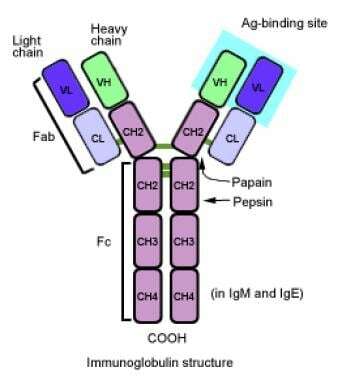 The classes are differentiated with the characteristics of the Ig heavy chain of the antibody. Each chain has domains called the V (variable) region and C (constant) region. Variable region constitutes the antibody binding region of the molecule to the different antigens as it consists of about 110 amino acids that vary widely among the different antibody molecules. The constant region at the carboxyl-terminal end of the heavy chain, called the Fc region, binds to the Fc receptors of neutrophils, eosinophils, macrophages, dendritic cells, B cells, and the natural killer (NK) cells. The Fc region is also involved in the activation of the complement system. Antibodies can bind to the different antigens causing agglutination and precipitation of the antigens leading to neutralization of the antigen effect. They can also stimulate the destruction of antigen by cells like macrophages, neutrophils, and eosinophils by covering the surface of the antigen by the Fc portion of the antibodies in a process known as "opsonization." Heavy chains are designated by letters of the Greek alphabet (ie, γ, α, μ, ε, δ) for Ig classes: G, A, M, E, and D, respectively. Human IgG consists of 4 isotypes: IgG1, IgG2, IgG3, and IgG4. For example, IgG1 contains Cγ1 as its heavy chain. The constant (C) regions of IgG, IgA, and IgD consist of only 3 CH domains. In IgM and IgE, the C regions consist of 4 CH domains. Light chains κ and λ are identified by their C regions. κ is encoded on chromosome 2 and λ is encoded on chromosome 22. An Ig molecule has either κκ (60%) or λλ (40%) but never one of each. An individual B lymphocyte produces only κ or λ chains but never both. Variable regions VL and VH form the antigen-binding sites that consist of complementarity determining regions (CDRs) of about 10 amino acids and account for antibody diversity. Three CDRs exist in each V region; CDR3 is the most variable and, typically, has the most extensive contact with the antigen. Major histocompatability complex (MHC) molecules are also known as human leukocyte antigens (HLA), which are encoded on the MHC locus. Initial MHC molecules were identified by serological assays. The first MHC molecules were called HLA-A, HLA-B, and HLA-C. HLA-DR, DQ, and DP were identified using the mixed lymphocyte response assay. Each MHC molecule has one binding site. MHC molecules are bound to cell membranes. Interaction with T lymphocyte requires direct contact and are MHC Class I or II restricted. 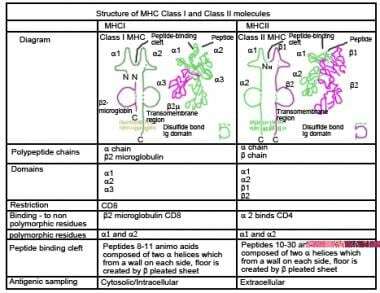 MHC molecules are expressed codominantly. MHC from both parents is expressed on cell surfaces (see image below). Intracellular and extracellular proteins can be processed by specific pathways and are presented in association with MHC class I or MHC class II molecules. Summaries of class I and class II antigen-processing pathways can be found in the images below. Major histocompatability complex class I antigen-processing pathway. Major histocompatability complex class II antigen-processing pathway. Newly synthesized MHC class I polypeptides remain sequestered in the endoplasmic reticulum. The proteasome is a multi-subunit proteinase. Antigenic peptides are transported into the endoplasmic reticulum by transporter associated with antigen processing (TAP) proteins. Antigenic peptides are loaded onto newly synthesized MHC class I polypeptides. MHC class I and antigenic peptide are transported to cell surface. Stable MHC class I expression requires presence of antigenic peptide (see the image below). Extracellular antigen is endocytosed (directly via Fc or complement receptors) and compartmentalized in cytosolic phagosomes. Phagosomes fuse with lysosomes. The resulting phagolysosome degrades the microbe into antigenic peptides. These are soluble protein molecules (eg, IFN-γ, IL-4, TGF-beta, IL-13, IL-5) secreted by not only the cells in the immune system like lymphocytes, macrophages, or leukocytes but also by many other cells in the body like endothelial cells, fibroblasts, etc. These molecules also act on many different cells in the body in addition to the cells of the immune system. These cytokines are involved in regulation of many other processes in the body like growth, development, and mediation of the inflammatory response in addition to activating the immune system. The cytokines can also effect the cells that they are originally secreted from known as autocrine effect, if they effect the cells in close proximity to the cells they are secreted from it is known as paracrine and if they are secreted into the circulation and effect a target organ far in the body from their secreting cells, it is known as endocrine. Lymphocytes are further classified as T, B, and natural killer (NK) cells. T and B lymphocytes can only identify an antigen. Functionally, they both differ in their production and maturation history due to the receptors present on the surface of both the lymphocytes. All 3 are initially formed in the bone marrow where the B-lymphocytes and the natural killer cells mature and leave to seed lymphoid tissue and organs in different parts of the body. Whereas, the T lymphocytes after leaving the bone marrow go to the thymus gland, where they further mature by going through a selection process. T and B Lymphocytes can also be differentiated from each other based upon the surface receptors present on both of them. All these cells continuously circulate throughout the body and also are present in the lymphoid tissue. The percentage of these different cells present in the different lymphoid organs differ also, with T cells mainly present in the thymus and then blood, lymph nodes, and spleen, whereas, the B lymphocytes are mainly present in the bone marrow and then in the spleen, lymph nodes, and blood. No B lymphocytes are present in the thymus gland. B lymphocytes on stimulation rapidly proliferate and produce antibodies against the antigen that stimulated it initially. Sometimes, the antigen is presented to the T lymphocytes and then the cytokines released from the helper T lymphocytes stimulate the B lymphocytes. leading to production of antibodies against that antigen. In addition, some of the B lymphocytes are also converted to memory cells that produce rapid response against the same antigen on repeated exposure. 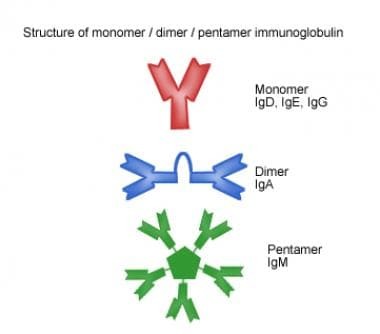 T lymphocytes are also stimulated by receptors present on their surface; however, T lymphocytes only recognize antigens presented to them bound to the major histocompatibility complex (MHC). T lymphocytes are divided into helper T cells and cytotoxic T cells. Helper T cells have CD 4 marker on their surface, hence they are also known as CD4+ T cells and are MHC class II restricted. On stimulation, they produce large amount of different cytokines, which differentiate B cells into plasma cells leading to further antibody production. Cytotoxic T lymphocytes and the macrophages play a significant role in the inflammatory reaction against the presented antigen. The cytotoxic T cells have CD 8 marker on their surface known as CD8+ T cells that are MHC Class I restricted. They destroy the cells via 2 mechanisms: one by attaching to the cells and releasing proteins called perforins into the cells that create holes in the cell membranes of the target cell with subsequent lysis of the cell. Second, they kill the cells by inducing the programmed cell death by a term known as apoptosis. Natural killer cells have the antigen recognizing receptors like the B and T lymphocytes on their surface. They attack foreign cells or abnormal cells like cancer cells and virus infected cells directly without any previous stimulation. Antigen presenting cells include B lymphocytes, macrophages, and dendritic cells (also called Langerhans cells in mucosa and epidermis). These cells have class II major histocompatibility complex (MHC) present on their surface that forms the complex with the peptides to present it to the helper T cells (CD4+). Innate immunity consists of pattern recognition receptors, antimicrobial peptides, cells, complement components and different cytokines. It is the fast, nonspecific response and does not generate any memory against the attacking antigens. Adaptive immunity includes stimulation of both the cellular and humoral response to the presented antigen with T lymphocytes mainly involved in the cellular response and B lymphocytes involved in the humoral response. The T lymphocytes, after being stimulated, release many cytokines, stimulating macrophages and other cells to destroy the presenting antigen. Cytokines released by the T Lymphocytes also stimulate the B lymphocytes, eventually leading to the production of antibodies against the antigen causing its destruction. In adaptive immunity, the body’s immune system also forms memory T cells and memory B Cells after the initial exposure, making the immune response much faster and specific on subsequent exposures. 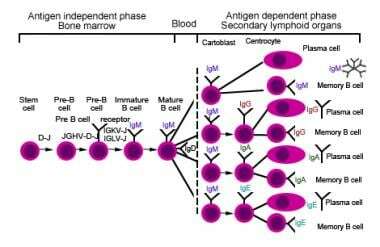 B lymphocytes: Humoral immunity pathway by producing immunoglobulin derived from and maturing in bone marrow. They recognize linear epitopes, major ligands, markers, and associations (Fc receptors, CD19, CD20, CD21, and MHC II). See the image below. T lymphocytes: Cellular immunity pathway where precursors arise in bone marrow but then mature in the thymus. They recognize conformational epitopes. They may subclassified into helper T lymphocytes (CD4+), cytolytic T lymphocytes (CD8+), and T regulatory cells (Treg’s). See the image below. T cell lymphocyte differentiation table. Once T lymphocytes are activated, they become either effector or memory T lymphocytes. Activation requires a second signal or costimulation. The costimulatory molecules are on the antigen presenting cells. Their ligands are on the T lymphocytes. No T lymphocyte response exists without costimulation. The T lymphocyte that recognizes the antigen but is not costimulated is said to be in a state of anergy (nonresponsiveness). Costimulators may produce activation or induce negative regulation of the immune response. Sarpe V, Jacob C. Simulating the decentralized processes of the human immune system in a virtual anatomy model. BMC Bioinformatics. 2013. 14 Suppl 6:S2. [Medline]. [Full Text]. Tao Le, B. Haymore, V. H-Trujillo. ACAAI Review for the Allergy & Immunology Boards. 2010. A. Mescher. Chap.14- Immune System and Lymphoid Organs. Junqueira's Basic Histology. 2010. Abul K. Abbas, Andrew H. Lichtman. Basic Immunology. 2010. Dennis Kasper, Tinsley Harrison. Chap. 308. Harrisons Principles of Internal Medicine. 2005. Kenneth Murphy, Paul Travers, Mark Walport, Charles Janeway. Janeway Immunobiology. 2008. Thomas Kindt, Richard Goldsby, Barbara Anne Osborne, Janis Kuby. Kuby Immunology. 2007. Disclosure: Serve(d) as a speaker or a member of a speakers bureau for: PFIZER.